The Oakland Running Festival or Oakland Marathon takes place once a year around the beginning of Spring. It started in 2010 and is currently in it’s 10th year and has been voted the “Best marathon in the PAC West” by Reader Choice Awards. I wonder how much they were paid for that. $140 base registration cost. Don’t expect a lot of people to fall for that. It seems like it doubles every year. The marathon actually consist of several races and classes to compete in, each costing quite a bit to register in. 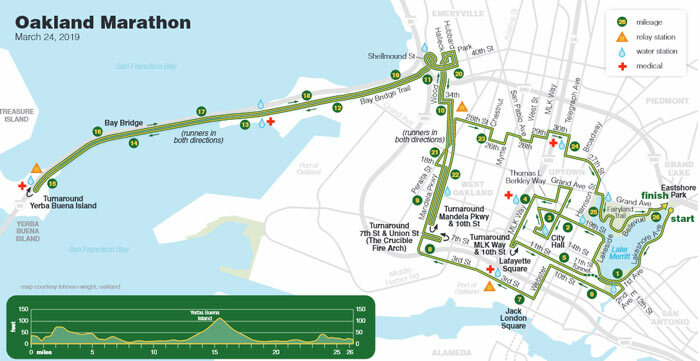 The full marathon is 26.2 miles around Oakland(the word marathon actually means a foot race of 26 miles and 385 yards). There is the half marathon, at only 13 miles and the 5k which is about 3.1 miles, the same as the distance around Lake Merritt. The Oakland Running Festival is a very much needed boost to the local economy and is estimated to have brought in over 12 million in hotel, restaurant and tourism revenues for the City of Oakland as well as helping raise about a million dollars for local charities over the last 9 years. But that is from you, coming to town to spend your money. Not from the actual event host. This Oakland event brings out a great amount of pride as runners make there way through Oakland on foot passing block parties, BBQ’s, live bands, DJ’s and more cheering the runners on. However, in recent years that has changed and the course no longer goes through neighborhoods violating peoples residence. It is now much more industrial keeping you out of actual Oakland. As for the event organizers, there is said to be only one. Only one person reaping in the profits and commissions as everyone else volunteers. There has been shady practice in the past where you are forced to register through a service that pops an unsuspecting free trial that suddenly charges you a $59 membership fee. While now they use Active Endurance it seems to be the same as Active Advantage. So be aware of that while signing up. And they are shady with all that pure profit. The “awards” are laughable. A keychain for a handful of people. Big stuff here. Have a good run Oakland!